Q: What happens when you watch the American Horror Story: Freak Show premiere and the first two episodes of Stalker all on the same night? 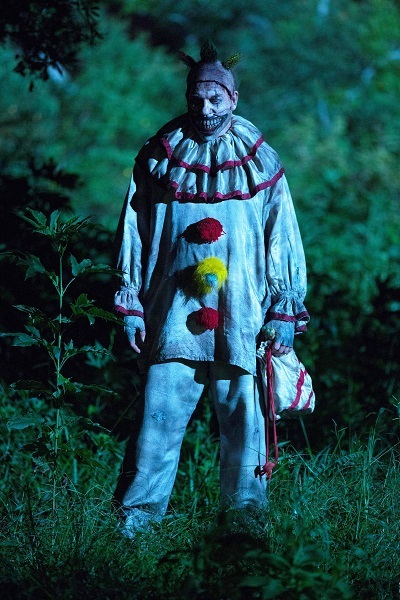 A: The next time you’re alone in the house, ALL THE LITTLE NOISES will cause you to jump and imagine that the most terrifying clown you’ve ever seen is creeping around your windows. And, if you’re kind of warped, like me, you’ll love it. Fear is a mysterious emotion. It can be taught, or it can be intuitive. It can be provoked by things we perceive with our own senses, or by others’ senses. Fear as a response to external stimuli real or imagined can also be unpredictable. Twisty the MURDER Clown, that is. I have phobias, meaning that I experience irrational fear in response to specific things. I also have PTSD, meaning that I have a few known “triggers” floating around in a deep lake of more inexplicable, unknown causes of panic. The resulting inner havoc is predictable even if its cause is not… it’s the familiar old Armageddon of panic and stress boiling in my core, rippling outward through my body like a fire spreading through a house. It feels like I’m being consumed. Sometimes, it even feels like I’m going to die, or like I have to die. I actually take medication for this. Throw in the by-product of clinical depression just to balance it out, and there you have the main reason I live for my body combat classes at the gym three days a week. I enjoy them because they’re amazing, yes, but I also need them for medical reasons. Intense physical training on a regular basis helps my brain chemistry better than anything. So it’s a mystery to me why, when a former boyfriend introduced me to the creepy PlayStation game Silent Hill (the only video game I’d played since the ‘80’s), I quickly became addicted and couldn’t wait for darkness to fall every night so I could huddle in the shadowy corner of the bed with all the lights out, trembling and listening to the discreet yet horrifying sound of snow crunching beneath my feet (leave it to developers of Japanese horror to make the sound of snow horrifying) as I walked through the abandoned town in search of my daughter. You would think the eerie sense of being watched and the unpredictable sightings and attacks would have sent me into PTSD Armageddon, but instead, I found myself craving more. It’s odd, this thing about the horror genre in pop culture. If scary movies, television shows, books or games manage to provoke fear or stir up the creep factor even a little bit, which very few of them can do, by the way – my favorites are the ones that can – I just twitch a little and then run back for more. Yet, the sight of a sewer roach encases me in fear and leaves me traumatized for days. Why is that? I would venture to guess that the PTSD lurks behind this incongruity. Fear strikes, and in that moment of skyrocketing adrenaline, I’m instantaneously alert and on edge. Maybe, in some perverse way, I love it because it makes me feel alive… alert, alive and ready to act, and when this response comes in the wake of stimuli that I know is fictional, I can just enjoy the rush. There’s no real-world threat in fiction. (A roach is not a formidable threat, but it is real.) Maybe I’ve become a “fight or flight” response junkie, though I don’t think I’d go so far as to say I’m addicted to adrenaline, a phenomenon that some people apparently experience. For me, in the case of creepy movies and T.V. shows and books, maybe I’m more just hyper-intrigued by the fear of the unknown, and of the (horrifying) possibilities. Neither am I sure that there’s much of a difference between this kind of fear addiction and the kind of garden-variety thrill-seeking that leads people to go bungee-jumping (I am not a thrill-seeker of the bungee-jumping variety). Whatever the case, I find the psychology of fear to be fascinating. Fear is terror-provoking, thrilling, necessary and fun. What emotion other than love covers all of that? My affection for the horror genre pre-dates my PTSD, so perhaps that’s significant, as well. On the tail of that tangent, let’s all take a moment to acknowledge that Halloween is just two weeks away. I’m beside myself with glee. We’re in a house now, which means that we get to give candy out to trick-or-treaters. 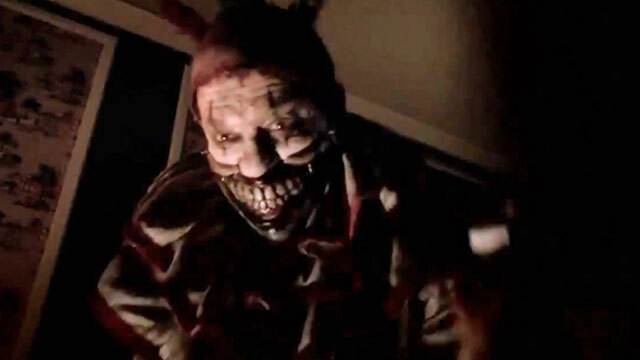 I wonder how many American Horror Story Twisty the Clowns we’ll find on our doorstep Halloween night? I can’t wait to find out! ← Blustery weather and popcorn don’t mix.